ControlTouch 61, 61-Key MIDI Keyboard from Music Computing. The ControlTouch is available with 25 or 61 keys and also sports eight drum pads, eight knobs and nine faders. It's Mac and PC compatible and comes with a virtual instrument that offers some 3,000 sounds. 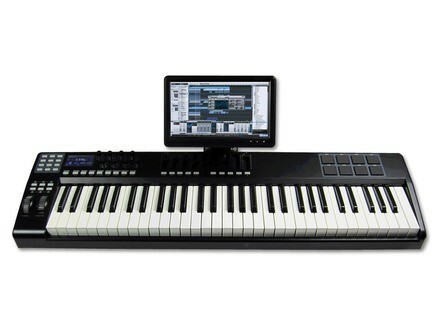 ControlTouch keyboard controllers are designed for the modern day musician who requires traditional keyboard controller features along with a video display and touch screen controls. "ControlTouch allows you to concentrate on your music creation or performance and less on the technology behind them," the company says. 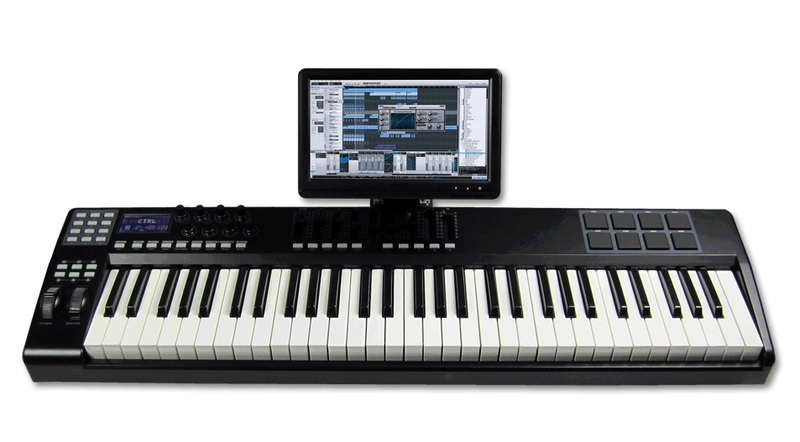 ControlTouch is designed to transform your laptop or desktop into a keyboard production station. Cross-platform: The ControlTouch is designed for use with Windows 7 or Mac OS X. You can plug the USB cables into your laptop or desktop and the ControlTouch is ready to go for Windows 7. For Mac OS X, install the included touchscreen driver and it too will be ready for use. Once the drivers have been installed into your laptops and desktops, you can connect the ControlTouch to either one without re-installing the drivers for a quick-change when necessary. Sounds: Included with each ControlTouch is Music Computing's SonicSource Producer, a virtual synth (VSTi / AU) containing 3,000 sounds and equipped with three sample-playing layers, two multi-effect racks, and a library of multi-sampled instruments. The sample playing layers are designed to allow blending of waveforms and instruments into a wall of sound or alternatively, the use of the three multi-timbral layers as a workstation. These layers can then be further processed through SonicSource's multi-effect racks. 8GB of sounds such as those produced by electric keyboards including the Rhodes electric pianos, Hammond and Vox organs, Hohner clavinets, and Moog synthesizers are present as well as effects like tape based delay lines, rotating speaker cabinets, guitar distortion pedals, wah wah, phasing, and flanging are included. Additional sound libraries will be made available from Music Computing in the near future. ControlTouch can be ordered now from the Music Computing website. Prices are $599 for the 25-note model and $699 for the 61-note iteration. Full Compass Quiet Speed Production PC Full Compass Systems announced that its latest Quiet Speed Production PC is now available for sale.